In late March 1997 my agent called and asked if I would like my face on the cover of U.S. News & World Report. Why the hell not? The magazine was doing a story on corruption in Major League Baseball — players illegally betting on the outcomes of their own games. I was to portray a baseball player wearing a blindfold — the old “see no evil” concept. It was a bit of a stretch for me since I never even played Little League, but I figured I could look shifty enough to be a crooked baller. I went down to USN&WR’s editorial offices in Washington, DC and did the shoot. Everything went fine and dandy. It was one of those super cool print jobs that leads to a tearsheet your mom will carry in her purse for the next ten years, ready to whip out on any hometowners foolish enough to ask her how I am doing. Of course, fate had other plans. In fact, fate set those plans in motion 4.6 billion years ago when the Hale-Bopp comet was formed in the Oort Cloud, a vast cloud of dust, rock, and ice that surrounds our solar system like a halo. Two days before my issue’s publication, Marshall Applewhite convinced 39 fellow Heaven’s Gate cultists to commit suicide in order to reach an alien spacecraft which he believed was following the Hale-Bopp comet. Suddenly the baseball story wasn’t front page news and my cover photo was axed. Of course I had already told my mom I was going to be on the cover, prompting her to alert everyone she’d ever met in her life. 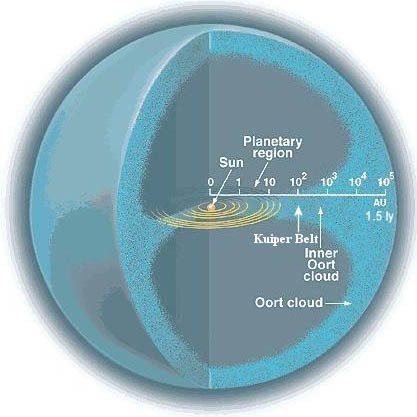 Thanks for nothing, Oort Cloud! This entry was posted in Show Business Humiliations, Space Cases. Bookmark the permalink.